Election Day is coming up Tuesday and you can be damn sure that I am going to cast my vote. I’m doing it for my Grandma Lillian and all the inspirational people that I’ve met over the years who have risked everything to secure their right to participate in government. In addition to farmwork and child-rearing, Thorina was a dedicated suffragist. She believed strongly in equal voting rights for women and she often participated in demonstrations advocating for the right to vote for women. Women received full suffrage rights in Norway in 1913, so Norwegian immigrant women (along with their Finnish, Swedish and Danish counterparts) played a notable role in the suffrage movement at the local level in Minnesota and other states with large Scandinavian immigrant populations. 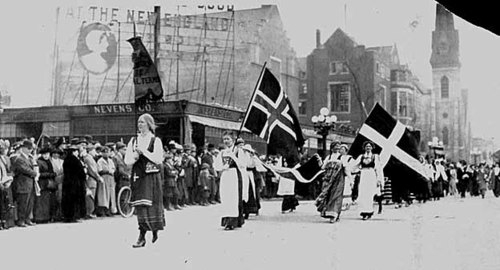 The photo at left shows women from several Scandinavian countries in traditional dress marching against inequality and for universal women’s suffrage on Hennepin Avenue in downtown Minneapolis. My Grandma Lillian grew up as a suffragist. She was still pretty young in 1919 when the Nineteenth Amendment was passed by Congress and ratified by Minnesota. Women’s suffrage became national law on August 18, 1920 when Tennessee became the 36th state to ratify the Constitutional amendment.In some ways, it is surprising to think that less than 100 years ago, women in America could not vote. I was a toddler in Louisiana when that state ratified the 19th Amendment in 1970 – 50 years after initially rejecting it. And Mississippi didn’t ratify the 19th Amendment until 1984! Now the right to participate in government is one that we Americans take for granted – so much so that less than half of the population votes unless it is a Presidential election year. In 2008, the voter turnout was 63%, a high water mark that is low in comparison with most countries. In U.S. local elections, the voter turnout is even lower. Many of the mayors of major U.S. cities are elected with single-digit turnout. That’s just shameful. I love to vote. In fact, I vote every chance that I can – legally at least. I always try to bring my kids with me when I vote, so they can see that having a voice in the democratic process is something both important and valuable. But when I’m standing in the voting booth, I feel like there are others there in the voting booth with me. They are some of the inspirational people that I’ve met over the years who have risked everything to secure their right to participate in government. I visited Sierra Leone in 2004, after the conflict had ended and just prior to the first post-conflict elections. As I traveled through the countryside, I saw people coming together for meetings to discuss the upcoming elections. In spite of the horrors that they had endured, they were coming together in villages big and small, to exercise their right to participate in their government. Here is a photo I took of a gathering in a village far out in the bush in the Kono district, an area that endured particularly brutal human rights abuses. Yet now, as the country was slowly emerging from the conflict, the villagers were coming together to discuss the upcoming local election process. Although my grandmother gained the right to vote, she was never able to go to college. She was certainly smart enough, but her family couldn’t see the point in wasting good money on educating a girl. Grandma Lillian never expressed bitterness about this to me. But one afternoon when I was in high school, I stopped by to say hello and to get her thoughts on my top college picks. I remember sitting in my grandparents’ darkened living room. A mantel clock ticked and the air conditioner hummed. It now seems impossibly calm and quiet, so different from my current raucous and messy living room. My Grandma Lillian told me that the most important thing was to follow my dreams. “You can do whatever you want to with your life. Be what you want to be. But never forget those of us who weren’t able to follow our dreams. Upcountry girls in Sierra Leone. Photo by my colleague Rosalyn Park. So that’s why I never miss the chance to vote. I’m doing it for my Grandma Lillian. And for everyone else who can’t follow their dreams. The photo at the top is of the Scandinavian Women’s Suffrage Association marching in a parade in Minneapolis in 1914. I keep it in my office in honor of my Grandma Lillian. Excellent article. We also take our daughter with us for every voting opportunity. There is so much we take for granted in this country and just assume it is our “right”…it is NOW, b/c of people like your grandmother. I know your grandmother would be proud of you. I'm glad you are following your dreams. When villagers turn 18 at Skogfjorden, I whisper in their ear “remember to use your voice” — voice also being the Norwegian word for “vote”. They think it's kind of weird. I think it's essential. You know, I remember learning “stemme” when I was 14 or 15. I thought it was really cool and I'm sure those villagers do, too. Also – Rock on, April! Excellent article Jenni. I love to vote and always appreciate the opportunity. I was so sad when my county went to “mail-in” ballots only. I miss the sense of community of going to my local school and voting in person. I am glad you are showing your kids how powerful it is to vote! I come from a long line of strong women. When I think of the obstacles they faced in their lives, it makes things seem so much easier for me. And yet women still have a way to go. REPOST – in honor of International Women’s Day! Thanks for the comment, Carol! Congratulations to you and the women in your family – you are an inspiration to all of us! Thanks for stopping by, Paloma! And thanks for your comment. Keep up the good work – your enthusiasm helps others! “… You can do whatever you want to with your life. Be what you want to be. But never forget those of us who weren’t able to follow our dreams. Follow your dreams for us….” I think this alone should have made people get up and vote. Do it for yourself and do it for those who can’t. Stand up for what you believe in, follow your dreams and make sure you do it with those in mind, who made this possible for you. Thanks so much for your comment! I was so pleased to see such high voter turnout yesterday. I wish more people realized what a precious right it is to be able to participate in a democratically elected government.